We had a wonderful time at La Selva. Everything you had set up went perfectly. We are still in Ecuador, traveling around on our own. We love your beautiful country and hope to come back some day. El lugar fue de nuestro agrado y el personal muy amable. Adicionalmente, quería agradecerte por tus servicios y de necesitarlos nuevamente me contactaría directamente contigo. My wife and I just returned to the States from a terrific trip to your country and our visit to Napo Wildlife Center and the Galapagos. Thank you and your agency for handling all of the arrangements for us. The booked trip at Tapir Lodge was perfect and at the lodge we got the top floor room as requested. the staff was great and highly motivated and enthusiastic about their work (in particular the tour guide Miguel and the kitchen staff). We're also very satisfied with the services of Columbus Travel. My friend and I were so happy with our experience at Tapir Lodge. It was an unforgettable trip that was made possible by Columbus Travel. Francisco Vela was great to work with. He was informative, quick with responses and made booking a lodge easy for me and my friends from Canada. Happy new year and thank you again! I was pleased and enjoyed the Amazon trip. The guide was excellent. The lodge workers were friendly, but not as accomodating. Local food options would also have been appreciated. 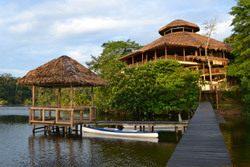 Just to let you know that I really enjoyed La Selva Lodge and the experience of the Amazon. Thank you for all your help on our trip to La Selva lodge. We had a very pleasant stay in this beautiful surrounding. You were right that we should enjoy every second of the scenery and wildlife. What a beautiful place to be in the middle of the amazon jungle. Also the staff was very pleasant and the food was excellent. From Coca the boat trip was very well organized. It was a convenient trip accompanied with a good meal and drink on board. The last boat trip towards the lodge is very nice: first a small creek and than crossing the beautiful lake towards the lodge. Every day we have made nice trips into the jungle and spotted a lot of wildlife. Thank you very much that you made this offer for us. We have enjoyed our stay in the Selva lodge very much and should recommend this location also to other people. Now we have returned home safely in Europe. I attach the comment card for the travels. I believe a couple of the students were also given comment cards by Gonzalo and they turned those in as we left. The trip was quite amazing and Gonzalo was an enthusiastic and knowledgeable guide. At all times I felt we were in good hands. Javier was exceptional as driver also, and the students liked them both a lot. Gonzalo was quick to adjust to our needs, even slipping in a visit to a rose plantation and an extra waterfall. We were a bit over-tired and lacking sleep a couple of days since we returned to our hotels quite late, but this did enable us to have a much larger adventure. Having a guide that was able and willing to hike distances and at high elevation was wonderful. Gonzalo even joined us for our open day at the end, for lunch and the botanic garden, on his own time. I would recommend him to any high school or college group without hesitation and I fully expect to stay in touch. The rainforest portion was exceptional as well, and Gabo and Roberto were wonderful guides. They have an amazing relationship with the Haoroni and we felt more like guests than tourists. I highly recommend this segment of the tour to any group willing to live in rustic lodging, to endure insects and in good physical condition. We embraced it and had a life-changing adventure. They were exceptionally helpful in our transfer to the airport in Coca as well, helping us to wrap blow guns and spears for the flight to Quito. If visiting the rainforest again I will be requesting Gabo and Roberto. If I were to change anything for next time it would be to encourage our Highland guide to spend more time explaining natural history as we saw the sights (the rainforest was excellent). This is not Gonzalo's fault and he did a wonderful job and did interpret much. It is that in hindsight I would have asked him to do this more, after we were underway ... it is something for me to remember for next time. Also, as you will see on the evaluation form, Hotel La Mision was disappointing and I would not stay there again. It appears the hotel was once nice but it is not now. Also, lunch on the 22nd was an apple and a small bottle of juice. That was a bit meager for a group of young folks who had been hiking that morning! And not on the form but worth mentioning is that drinks other than tap water were often not included with lunches and dinners. This left me to purchase drinks for the 10 of us, not a large expense but it did add up. One other unexpected expense was two guides in the rainforest instead of one (a good thing! ), plus the two Huaroni guides ... this also added expense for additional tips (x3). It was wonderful and I would not change it for next time, but it was unexpected. Again, we had a wonderful time and the students are still talking and comparing photos. I will be in contact for my next trip and we thank you for your expert guidance and that of our guides and drivers! PS - Hostal de la Rabida is a wonderful place and I plan to stay there again! I am so glad that I found Columbus Travel and our Tour Operator Francisco on the internet to help us plan our Adventure Tour. There were many emails back and forth in the planning phase regarding the prices, locations, accommodation, time frame for travel etc and all responses were prompt, informative and full of excitement. All the required documentation were supplied in quick order. They supplied a day by day itinerary and even a packing list for both places that we found very useful. The payment process had several options for ease. All Airports pick ups and transfers back and forth to Hotels were very smooth and the checking in at airports and Hotels was always taken care of for us. We did have a problem a few times not knowing a pick up time from hotel but the communication between the hotel and Columbus Travel was fantastic and some calls were made in the very wee hours. Solution was very prompt. The Oceanspray Galapagos Tour was Incredible. We were spoiled, spoiled spoiled!!!! The boat , the staff, The Guide, the Food.....Amazing!! The same can be said for the La Selva Lodge. It was a true Jungle experience with great food and accommodation. I would recommend 2 or 3 nights not the five that we stayed. Thank you Francisco. It was absolutely a Trip of a Lifetime. I would definitely book with Columbus Travel again. Esta es la nuestra ultima noche in Ecuador y stamos pensando a ti! Gracias para esta buona vacaciones y por los lugares especial de tu pais che tu has echo mirar a nosotros! Wow! Trip was absolutely amazing! Although Sani Lodge was not our first choice, it was the best choice. We had Fredy as our guide, and four days he enthusiastically revealed to us the beauty of his families' lands. Everyone made us feel welcome. From the food to our twelve companions, everything was excellent. We also were very fortunate to travel with a group who respected nature- quiet in the jungle and fun back at the lodge. Thank you so much! I was amazed at how flawlessly all of the flights, canoe trips, and accommodations were arranged. Best of all I got to spend a week with my son who has very much enjoyed the beauty of Columbia and Ecuador the past few months. Our trip to Sani lodge will be an unforgettable highlight. We have finished our trip and are very happy. Thank you for all your help and recommendations. Both la selva and the Ocean Spray were incredible. All staff members we encountered were very friendly, knowledgable and professional. My parents, Kelli and I are planning to return to Ecuador in February, and will definitely use your services again. I will also recommend you and Columbus travel to my friends. Again, thank you so much. Hello Christian, Thank you for your mail. Sorry that I sent you so many email. Our time at Sacha Lodge was great. Thank you for the recommendation! We returned from our wonderful holiday to Ecuador and Peru a week ago, tired but elated, and I wanted to let you how much we appreciated our trip. I am glad to say that you organized our trip very professionnally, your command of English is excellent and your aftersale service was perfect. The services that picked us up at various airports or tours were always there, on time, and very safe. Everything worked out perfectly, we could not have asked for more. Raoul and I are very grateful for the wonderful trip you organized for us, all your suggestions during the planning stage, the way you were always nice and understood our requests, the fact that you suggested a last minute change to still improve the itinerary, and all your help along the way. We could not have asked for better. If you wish to post my comments, or for me to do it, please feel free to do it or ask me to do it. I wish we could have met you when in Quito, but it was not meant to be I guess. just a quick email to let you know how my trip went, I had a wonderful time in El Selva Lodge it was a great trip & I saw lots of things every one gave me a good service. just a quick note to again thank you for the most wonderful trip of my life. Ecuador is fantastic, the people unbelieveable and the trip a dream come true....that's thanks to your help in organizing it all. Everything was perfect. I will definately tell everyone about you and book thru you....thanks again. We just wanted to thank you for this amazing trip to Ecuador. The trip was extremely well organized and was a great experience! thank you very much for your support during our trip to Napo Wildlife Center, we have enjoyed it very much ! Hope you have a great time, Ecuador is truly an amazing country ! Congratulations ! Yes my trip to Ecuador was fantastic, really. The Huaorani lodge experience was an excellent recommendation, it really was the authentic experience I was looking for, the guides were brilliant and made sure we all had a great time and of course only having three guests was ideal. Likewise the galapagos was everything I had dreamed it would be, again the boat recommendation was fantastic, crew were so helpful and friendly. The only thing I would say, and everyone on the trip thought this, that unfortunately the guide, although very knowledgeable about the Galapagos, was quite irritable and often sarcastic with us, I think he was just sick of his job and you could tell he didn't want to be on the boat, which made it uncomfortable at times. La Rabida hotel was lovely, I would definitely stay there again and your service and recommendations have been excellent, I'm not sure you could improve anywhere and overall it's been one of the best holidays I've ever had! so thanks again. The trip to the Amazon also turned out to be a wonderful experience although not exactly as planned. I had really hoped for Kapawi but weather, as you know made that impossible so going to Yachana was not our first choice, but as it turned out it is an extraordinary place and you can certainly send people there in the future. It has an educational program for local children which is remarkable and its located in a beautiful spot. Our guide was amazing and we will stay in touch with him for the future. All of us thoroughly enjoyed the trip. You worked your hardest to help us stay in a variety of hotels, though I miscommunicated the dates. This was rapidly rectified however, and we loved every place we stayed. The Napo Wildlife Center couldn't have been better, the tours you arranged for us both to Odavallo, and the city tour were outstanding. The guides exceeded all expectations, as did your driver. It was great to meet you personally. The ship, and the Galapagos tours were also outstanding. Thank you so much. We will certainly recommend you and Columbus Travel. We have returned to Germany last Sunday. It is an urgent wish of mine to thank you for your wonderful support and engagement! You made it possible, that our holiday in Ecuador was a great success. It was amazing for us how you worked in the background to make everything function. Please show this e-mail to your boss! All the best to you with many thanks! I want to use this opportunity, even if it comes late, to thank your team for supporting us in preparing and making our trip to Ecuador and Galapagos a wonderful experience! Everything really was excellent arranged, all recommended places turned out to be more than worth to visit, including hotels and lodges. The Alta was wonderful, as the week in Galapagos was. All local transports, really everything was perfect! Congratulation for your company and your team, including Angie, who supported us in everything.You can have a look to the photographs for Angie, if you like anything for your website, I will be happy to provide it to you. All pictures (in total 3,500!) were taken in digital, so if you are looking for anything specific, I can look into my data, wether something is available from our trip. We visited La Selva, Equator Monument, Otavalo, Cotopaxi, Riobamba (train drive), Cuenca and finally one week on the "Alta"... So, either by CDR, or by email, if you require something...Thanks again and best regards, especially to Angie, Luisa and Elena.